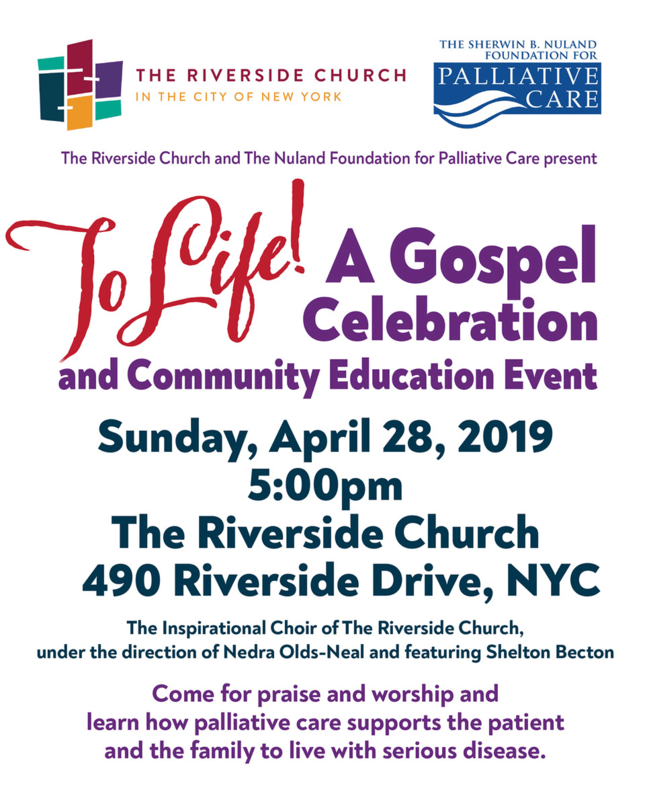 The Riverside Church and The Nuland Foundation have organized the following program: “To Life…A Gospel Concert”, to take place on Sunday, April 28th, 2019 at 5pm at The Riverside Church, 490 Riverside Drive, Manhattan. This free gospel concert is a celebration of life through song and through inspiration. The Inspirational Choir of The Riverside Church, under the direction of Nedra Olds-Neal and featuring Shelton Becton. will begin the program with praise and worship. From there the story will unfold. This is the story of how palliative medicine, a supportive medicine that is used in conjunction with curative medicine, can help the patient and the family live with serious disease. Reverend Debra Northern, The Minister of Parish Care at The Riverside Church, will host the evening. Cardinale Smith, MD, Associate Professor of Palliative Medicine at Mt. Sinai will be the medical authority and answer questions as to who gets the care, how is it gotten and how is it paid for. This program is free and open to the public. The event is organized by The Sherwin B. Nuland Foundation for Palliative Care and The Riverside Church.